Should I Stain or Paint My Wooden Fence? 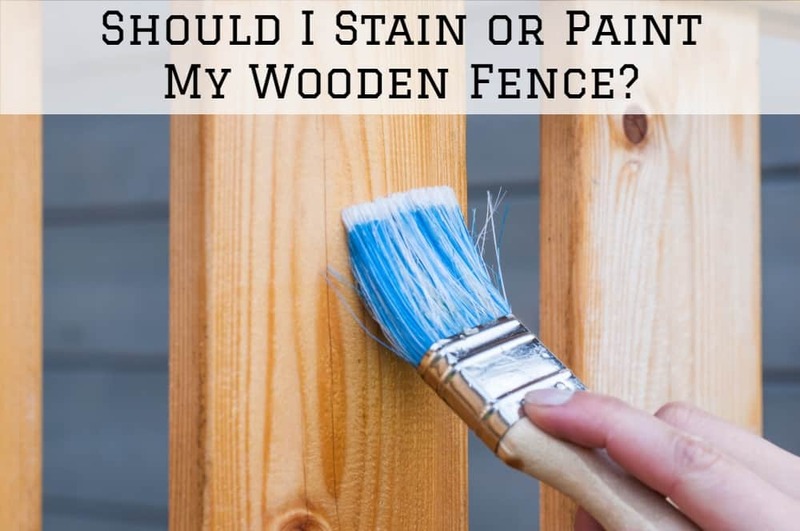 Deciding on whether to stain or paint your fence can be a tough decision. This is especially challenging for homeowners who have recently erected a wood fence. There are various factors to consider before making a decision on what to go by. Outdoor fences will be in constant contact will extreme conditions the prevailing weather has to offer. It is therefore vital that a weatherproof option is selected. Stained and painted fences with periodically require your attention in terms of maintenance. This is one of the major factors to consider when selecting the type of finish for your fence. This article will help you choose the most suitable finish for your fence. Fence paint and stains are applied in a similar way although each finish has its own requirements. Painting will require intense preparation before the paint is applied on the fence. This includes scraping, pressure washing, and application of a primer which may be time-consuming. Sanding may also be required on rough wood fences thus increasing the time and resources spent on this finish. Once applied, exterior paint will take a minimum of four hours to dry. Stain can be easily applied on rough surfaces. Raw wood will especially be suitable for this finish as it will get soaked up giving your fence a magnificent finish. Applying wood stain will reduce the time spent on preparing the surface. On the downside, however, the wood stain will require not less than two days to dry completely. Durability is one of the major factors influencing the selected wooden fence finish. Wood stain is highly durable when compared to paint. The stain applied will never crack or peel off from the surface. This is highly contributed by the fact that wood stains soak up surfaces rather than coating it. As time goes by, however, the stain will fade requiring a new coat. Reapplication is therefore recommended after every three years. External paint cracks and peels after interaction with various weather conditions. These scraps and peels are a good indicator that your fence needs a new coat of paint. When high-quality latex paint is used, repainting will be required after three to five years. Recent technology has seen the development of colored wood stains. The colors are however limited to different hues that are closer to natural wood colors. In order to achieve the desired color intensity, heavy coats will have to be applied. This may lead to inconsistency in the achieved color due to the long drying time. Painting offers unique and vibrant colors to choose from. When a good primer is invested in, a fabulous finish will always be achieved. Painting gives you endless color options. So if you’re interested in a vibrant fence that looks flashy or stylish, painting is the way to go. Type of Wood on the Fence. The type of wood and wood surface on your fence will definitely affect the finish chosen. Cedar fences, for example, will be ideal to stain rather than paint. This is due to the fact that paint may reduce its lifespan. Painting cedar will also lead to a charred finish as it does not take paint well. Treated wood surfaces, on the other hand, are more suited to painting than staining. Treated wood hardly absorbs wood stain thus painting will come in handy. Previously painted surfaces will also be suitable for this finish as staining will involve more work. Painting can also be done on previously stained wooden fences. Painting requires intensive preparation before application. This preparation will cost you time and money. Unfortunately, this preparation has to be carried out every time painting is scheduled. Staining requires minimal surface preparation but may also require intensive surface preparation when the surface to be stained was initially painted. When reapplying the stain, pressure washing will be enough to remove accumulated dirt on wooden fence surfaces. In the long run, however, painting is more cost effective. Lasting up to six years, painted surfaces will require minimal maintenance. Wood stain will require reapplication every three years, which may end up being expensive. So, should you paint or stain your wooden fence? The above comparison will help you choose the best for your situation. If you’re interested in preserving the natural appearance of your wooden fence, staining will be suitable for you. However, homeowners looking for a colorful fence that will require minimal maintenance will find painting an ideal option.